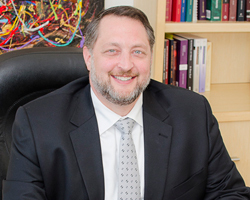 Erik D. Fine, an associate attorney at Simms & Associates, is a graduate of Kansas City Community College where he received an Associate of Arts degree in Law Enforcement in 1989 while on a baseball scholarship. He received a Bachelor of Science degree from the University of Alabama at Birmingham in Criminal Justice in 1991. He was admitted to the Birmingham School of Law in 2008. Mr. Fine has served both as a police officer and a corrections officer for a total of 19 years. As part of his law enforcement training, he was certified as a traffic accident re-constructionist by the Institute of Police Technology and Management and is experienced in car, motorcycle, commercial vehicle and train crashes. Mr. Fine served honorable in the United States Navy as a hospital corpsman aboard the aircraft carrier, USS Enterprise (CVN-65). He is also a certified paramedic, having successfully passed his National Registry Exam in 2007.